On Saturday afternoon, March 15th, I was one of the guests of honor at this year’s American Cancer Society’s Relay For Life. The event was like many other events I have attended in the past. The room was a modern elegant theater style auditorium, the podium was strategically set on a lavishly decorated stage with large screens at either end of the stage. While I sat in one of the many comfortable director chairs set on the stage for the guests and speakers, I could see my partner Linh Tang and several of our designers sitting in the audience. I could hear the D.J.’s background music playing one of my favorite Beatles songs, and the M.C. at the mic repeating the infamous pre-show “testing, testing, testing”, sound check mantra. 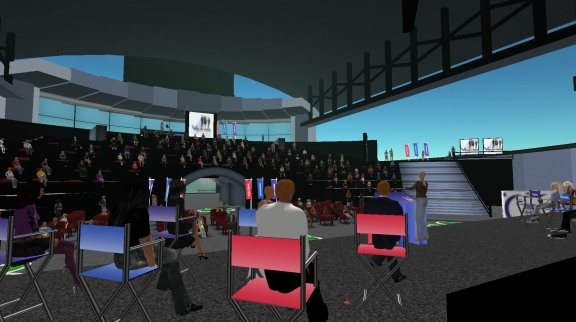 Once everyone quit-out and restarted SecondLife, we were all back in our seats where we left off as if nothing ever happened. The M.C. assured us all that everything was how O.K. and we would begin our ceremony shortly. He told us all that this turn out was even greater than last year’s celebration where the ACS raised more than $120,000 in donations for cancer research. He further announced that there were 82 teams totaling more than 1,200 Relay participants from around the globe. He went on to say that “With these numbers, this was the largest event in SecondLife ever and as SecondLife was the largest virtual on-line community, we were participating in the “largest virtual activity” in history!” With that the D.J. played “We Are The World”! Wow! The reason for my attendance was to represent Paper Models, Inc., my three-dimensional advertising company that creates three dimensional paper models that replicate fictitious or actual objects and landmarks. Back in October of last year we worked with ACS to develop a paper model replica of their Memory Tree; which is the highlight of their ACS Island headquarters. There, you can meet survivors, patients, councilors, and care providers. You can also walk over to their Tree, click, and download your very own 3D Paper Model Memory Tree. That’s what we do, transition objects from the virtual world to real world often with embedded advertising, and we just did it again! 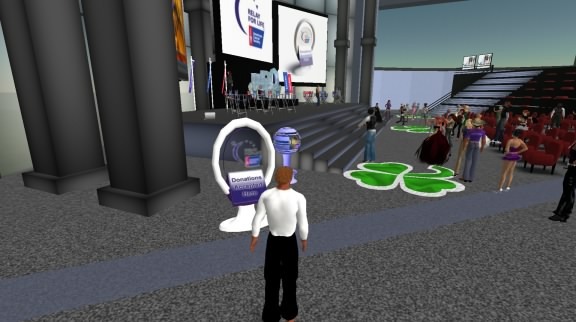 This year Steven Groves came up with the idea to create a Cancer Society Donation Kiosk Design Contest in Second Life. Virtual designers from around the world would compete in designing a donation kiosk that would be placed throughout SecondLife allowing people to donate Lindens (in-world dollars), to help fight cancer. The winner would win a combination of cash, gift certificates, and recognition. While we thought there would be a dozen or so designer competing, 125 designers registered. 22 designs were chosen to compete by an international panel of judges of which I had the honor of being one. The 22 designs were displayed at the ACS Island headquarters and were voted on by the public narrowing the contestants down to just twelve. It was then the judges had the difficult decision to pick only one in each of two categories; high prim and low prim count. A prim being an individual element or graphic comprising every object in SecondLife. Paper Models would create a 3D paper model of the winning kiosk entry. A week earlier I participated in the judging and a meeting that you just couldn’t image a few years ago. Myself, Estaban Graves (Steven Groves), my partner Linh Tang, several members of the judging committee, and representatives of ACS. We walked around looking at the entrants and discussed each of their virtues. We voted and chose a winner. Within moments, a beautiful young avatar walked up to us and introduced herself as the designer of the kiosk we just chose to win. How exciting! I was in Gilbert, AZ, Steve was in Scottsdale, Linh in San Diego, and the designer was from Orlando, FL. We were walking around and communicating with each other through verbal speech. It was as if we were in the same park even though we never left our respective offices from around the U.S. Within a few moments of us meeting the kiosk designer, I was joined by other avatars who I didn’t recognize. When Ro Brandenburgh introduced himself, I quickly realized that these new additions to our meeting were our three designers who had many of our incredible paper model landmarks and school projects. What made this meeting of the avatars so exciting was, these three of our designers are in the Ukraine, the former Soviet Union! Although I have worked closely with them for more than a year, I have never actually met them or spoken with them. We communicate through email only. Suddenly I was surrounded by all of the key players in this project from around the world; all in one place at the same time to meet, bond, exchange ideas, and work together as a team. It was truly amazing. The ACS Relay For Life event turned out to be remarkable and memorable. There were speeches by survivors that were both heart wrenching and heartwarming. 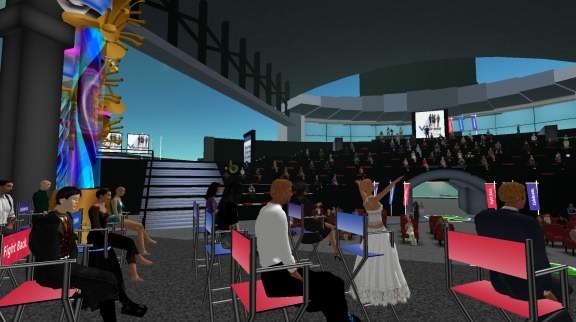 The awards were terrific, the music was great, and after there was networking and even virtual dancing to real live music. I consider myself very fortunate to have been born at a time where I could meet with my employees from around the world without ever leaving my office. Where the first generation who only sees people and not color, race, or religion, the fall of the Berlin Wall, the disbanding of the Soviet Union, the affect Hong Kong is having on the Republic of China, the Euro, and even the global “Green” attitude. For the first time in my life I got to participate and watch other people from around the world come together to fight in a war, a war on cancer and not each other. 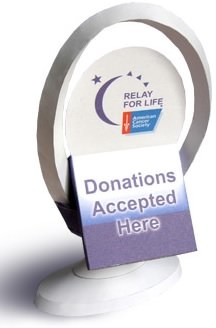 To download your free paper model of the SecondLife American Cancer Society’s Donation Kiosk, Please Click Here. Please remember to donate to ACS’ Fight Against Cancer. It could just save your own life someday.